We are equipped with a large set of robotic formulation devices that can accommodate a large set of ingredient dosings in various concentrations to deliver final library compositions. Compositions can vary from powders over low viscosity aqueous or organic liquids/solutions to high viscosity solutions/dispersions. Both, streamlined commercial robotic platforms as well as custom made robotic systems are available. Our large set of screening devices is specifically adapted to the needs of HT formulation technologies. These screening devices can cope with the requested speed for fast analysis of formulated compositions (solutions, dispersions, inks, …) and layered coated samples. Both, commercially available systems as well as custom-made robots have been implemented. With our large set of coating, dispensing and jetting robots we can create libraries of coated samples with high reliability and with limited time. For the jetting robots we also have a large variety of screening methods to study the jetting process itself. High Throughput Technologies are typically employed in the context of combinatorial testing approaches, making use of advanced experimental planning (prior to formulation and screening) and evaluation (after formulation, coating and screening). Design-of-Experiment and Analysis-of-Experiment knowledge is available in order to improve development and optimization processes. For many HT techniques the optimal tools of choice are not always commercially available. 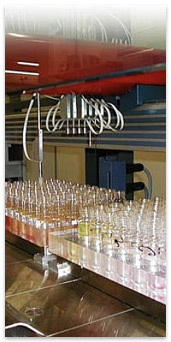 Based upon customer needs available workflows and/or robots can be adapted or constructed so that the real bottleneck in the HT process is tackled. In that context, Machine Vision, Image analysis, Device Synchronization, PLC and Labview programming are frequently used.